As an artistic person I was attracted to the colours, texture and shape of the fruit and thought they were beautiful! I cut open the fruit and the fragrance was amazing- it had a ‘sweet’ perfume and tasted like cross between a melon and an apple. So I did some research on the fruit. 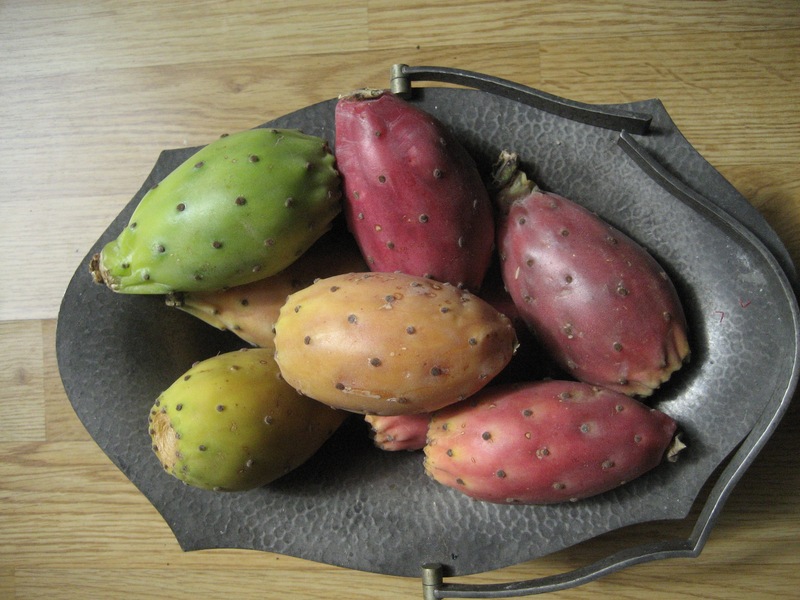 Apparently it grows on a cactus in semi-arid regions and is better known as Opuntia ficus-indica. It is a common drought-resistant fodder plant. 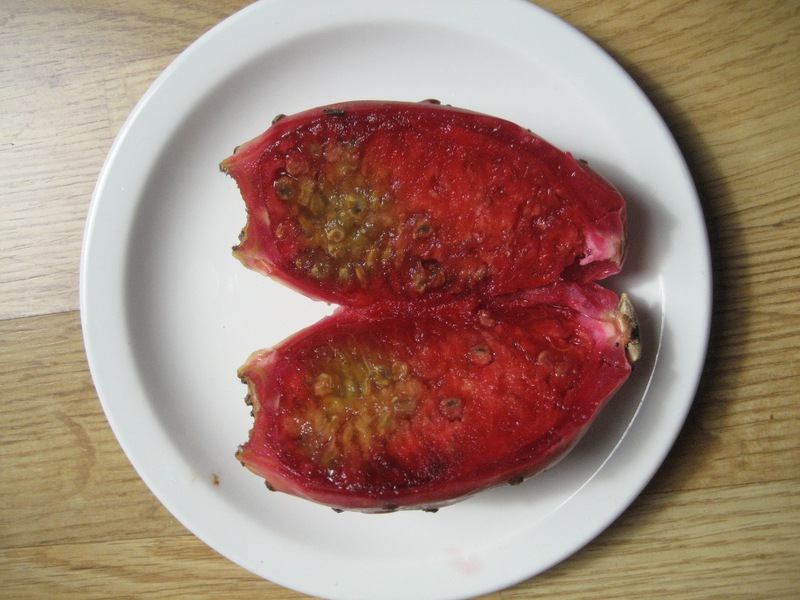 The fruit can be chilled in the refrigerator for a few hours and then cut into slices- the outer hard skin and seeds are not eaten. They can be boiled and made into jams and juices. Mexicans eat the young cactus pads sliced into strips, skinned or unskinned, and fried with eggs and jalapeños, served as a breakfast treat. In the early 1900s the USA imported these from Mexico and the Mediterranean countries but they gradually fell from f(l)avour during the mid-1950s. Since the late 1990s, they have become popular again. 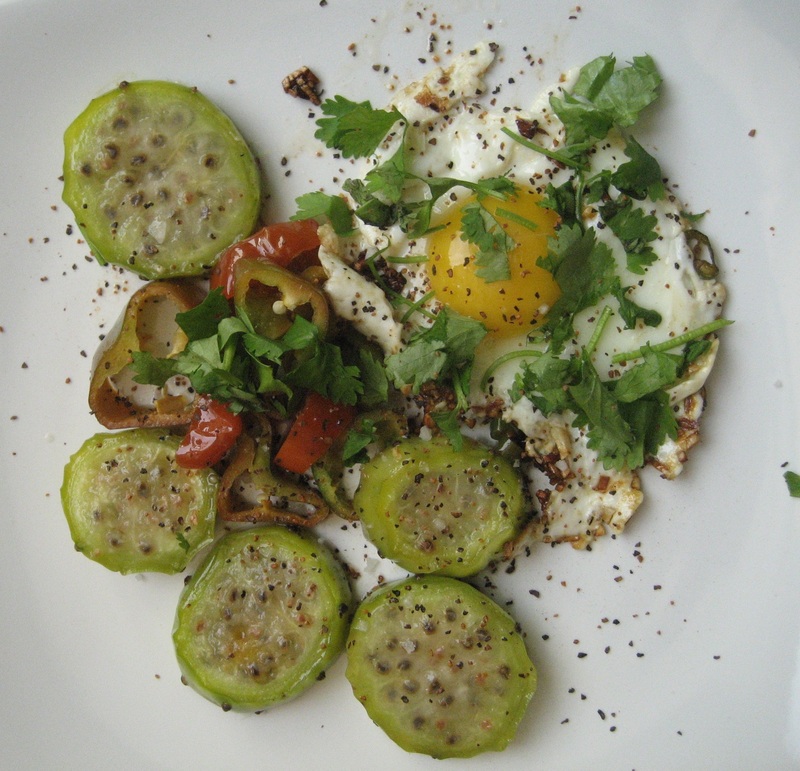 Below is my version of the Mexican breakfast made with fried green prickly pears, Romero peppers, green chilli, fried egg with cumin, garlic, coriander and red pepper seasoning. I was also amazed to find out that they serve as not only fodder and drink for the cattle in the Southwest United States but also may be used for a boundary fence. Cattle can be made to stay in one area enclosed by a prickly pear fence. The spines can be burned off to reduce mouth injury to the cattle when feeding them with the plant. The cactus pads, on which the cattle feed, are low in dry matter and crude protein, but are useful as a supplement in drought conditions. In addition to the food value, the moisture within provides the cattle with hydration. All from a lowly cactus! I will try to grow one from the seed. So next time you see an fruit or a vegetable that you’ve never eaten before- do try it! You may learn something about our wonderful world as I did. Categories: beauty, benefit, cactus, exotic plants, experiment, growing, health | Tags: beauty, beneficial, cattle, fence, fruits, Mexico, USA | Permalink.